The entrance to the Bible Lands Museum, Jerusalem (2016) (photo by Oren Rozen via Wikimedia Commons). The Bible Lands Museum in Jerusalem recently unveiled a new exhibition, Finds Gone Astray, to great fanfare, but it has so many ethical and legal violations that it’s hard to know where to begin. Last month, the Bible Lands Museum in Jerusalem unveiled a new exhibition, Finds Gone Astray, to great fanfare. The exhibition presents a heartwarming story: artifacts rescued when antiquities trafficking was thwarted over the last 50 years. The opening received extensive coverage in all the major Israeli news outlets. “Jerusalem Museum to Display Looted Near East Artifacts,” one headline read. But, to those familiar with the Bible Lands Museum, the headline reads as something of a joke. The museum was founded by Elie Borowski to house his collection of unprovenanced antiquities. Borowski was an antiquities dealer and collector who was well known for his ties to the illegal antiquities trade. When the museum opened in 1992, his wife Batya — the museum’s co-founder and former director — openly admitted to the Baltimore Sun that the museum’s collection was stolen: “You’re right. It’s stolen.” Her defense was that the Borowskis hadn’t stolen the artifacts themselves, but instead had “saved and preserved so much of our history and heritage” by their collecting activities — “our” heritage, as if they bought (and then profited from) those stolen antiquities for us. 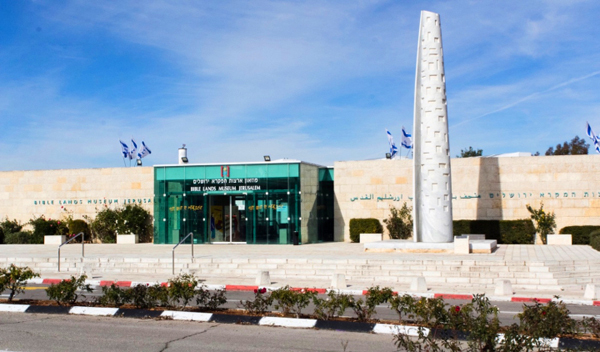 Despite this shady history, the museum has a quasi-official status in Israel. Then mayor of Jerusalem Teddy Kollek — himself a collector of antiquities — encouraged Borowski to move his collection to Jerusalem and display it there. The city donated land to Borowski for the project. This is not just any land, but is what is now known as “Museum Hill” — across from the Israel Museum (the country’s national museum) and the new campus of the Israel Antiquities Authority (IAA), the government authority that oversees archaeology. And virtually across the street is the building housing the Knesset, Israel’s parliament. Certainly the Bible Lands Museum is no stranger to questionable displays. Visit the museum now and you will be able to see some of the Al-Yahudu tablets, cuneiform texts that describe the Jewish community in exile in ancient Mesopotamia. But these are unprovenanced texts from a private collector who has failed to provide information as to their origin. And they are texts that were almost certainly looted and smuggled out of Iraq in the wake of the Gulf or Iraq wars, in violation not only of Iraq’s antiquities laws but also of a UN Security Council resolution. But the current exhibition, with its unintentionally ironic title Finds Gone Astray, is another matter altogether. Finds Gone Astray showcases a selection of the roughly 40,000 artifacts seized over the last 50 years by the Archaeology Department of the Civil Administration (ADCA) — the Civil Administration being the name for Israel’s military government in the West Bank. The artifacts include both those illegally excavated by looters in the West Bank as well as those confiscated at the border as people tried to smuggle them into the West Bank. The exhibition has so many ethical and legal violations that it’s hard to know where to begin. The Bible Lands Museum’s press release, followed by news reportsfrom several sources, lauds the exhibition as a “unique cooperation” between the museum and the ADCA. This much is true, and it is stunning. Never before have the ADCA and its head, the Staff Officer of Archaeology (SOA), participated directly in an exhibition and opened its warehouses to share its finds. The SOA and his archaeology department are notoriously secretive — so much so that when Tel Aviv University archaeologist Raphael Greenberg successfully sued the previous Staff Officer in 2007 to obtain access to the ADCA’s closed database of sites, he was overwhelmed by the thousands of excavations and surveys that had taken place in the West Bank since 1967. But all of this activity, every single excavation and survey, is in violation of international law. Specifically, the 1954 Hague Convention tightly restricts archaeological activity in occupied territory. Archaeology by the occupying power is restricted to salvage work, and then only in cooperation with the authorities of the occupied territory. Needless to say, none of this activity has been coordinated with the Palestinian Department of Antiquities and Cultural Heritage. The Israeli government’s position is that the West Bank is not occupied territory but the Israeli territory of Judea and Samaria, and so the 1954 Hague Convention and other laws of war, which govern occupation and other aspects of armed conflict, do not apply. This view appears to be endorsed by the Bible Lands Museum. Its signs use the terms Judea and Samaria for the West Bank, and refer without context to the “establishment of the Civil Administration in Judea and Samaria in 1967.” However, the international community outside of Israel is unanimous in understanding the West Bank as occupied territory. The artifacts on display in Finds Gone Astray are somewhat different: they were not obtained by excavation or survey work but confiscated from looters and smugglers. But international agreements governing occupied territory are still relevant. A recent example provides a glimpse of how the ADCA’s confiscations work, and how international law matters. Last April, NPR’s Daniel Estrin and Haaretz’s Nir Hasson reported on the case of a medieval Torah scroll originally stolen in 1995 from the Samaritan community in the West Bank. The scroll was smuggled to Jordan, but little more was known of its fate until 2013, when the ADCA confiscated a single parchment panel from the scroll at the Allenby Bridge (the West Bank’s border with Jordan). The man from whom it was seized was an Israeli Arab who claimed he had bought the panel in Amman. Five years later, the panel was still held by the ADCA. The man who had bought it in Jordan tried to sue for its recovery, but the ADCA and the IAA (which governs archaeology in Israel proper) conspired to confuse the issue of who possesses the panel. The ADCA had turned it over the IAA temporarily but then took it back.